December :: 2014 :: Oracibo.com - Food, Travel, Design and Cooking! I was on a search yesterday, as per usual, in my many accordion files filled with recipes, for something or other. And once again, what I was looking for had been misfiled! I hate it when I do that! Anyway…when I began checking the other sections in said file, I stumbled upon a section of memories: memorable meals from Christmas season’s past shared with family and friends. The first thing I found was a menu from our annual Christmas Eve open house where we always served Tourtiere, salad and a wack of hors d’oeuvres…looking at it now I see the difference 14 years can make in one’s energy level…whew! And there was the menu for Christmas dinner the following day: keep it on the simpler side but still there was the roast turkey, stuffing, gravy and a couple of vegs. Luckily I could make the Danish red cabbage a couple of days ahead, make my gravy base the day before and prepping a couple of pounds of green beans doesn’t take too long. Those were the days! I made a Christmas pudding well ahead….I was kind of missing Christmas pudding this year! 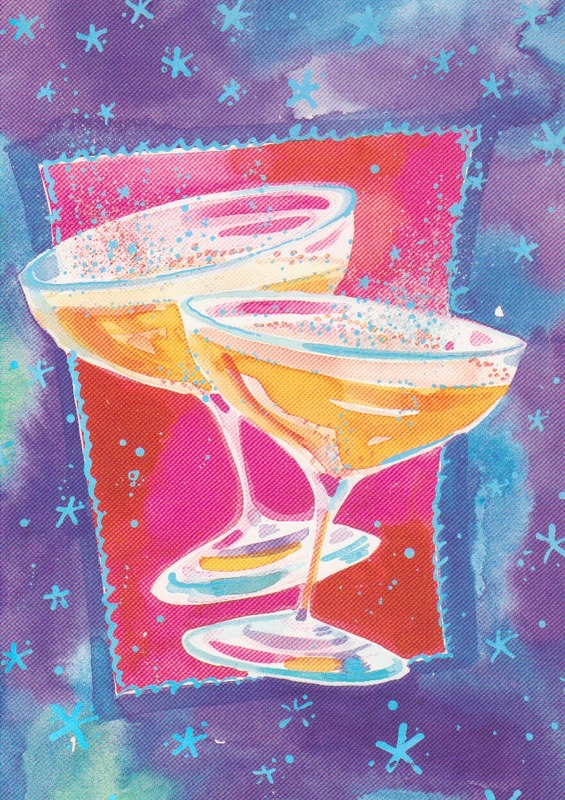 And last but definitely the best, was the menu for New Year’s Eve 1998 with two very good friends! Aah, those were the days! Sitting down to dinner at 9:00 and still going strong well past midnight. Like I said earlier, we had a lot more energy 14 years ago and stayed up to ring in the New Year and then some…now we just ring in the New Year as it’s happening in some other time zone because we usually can’t make it in ours! I would like to wish everyone a very Happy, Healthy and Joyous New Year! Felice Anno Nuovo a tutti! I may have mentioned that I adore tomatoes! It’s called “summer’s bounty” for a reason! I had lunch with a few friends not long ago and when I saw this on the menu I could almost feel my blood pressure rising. Am I the only person out here who is driven crazy by this? There seems to be a mind melt with chefs when it comes to “Tomato Bocconcini Salad”. 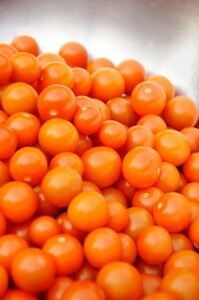 Think summer people, think in season, red, ripe, luscious, juicy tomatoes with fresh bocconcini! Well that is what we should be getting. BUT oh no….when summer is over we get out of season, tasteless, pink tomatoes; an insult to what should be a lovely SUMMER salad! It’s wrong…it’s just wrong! Here’s what should happen. Think end of July to end of August, early September. Now envision the aforementioned in-season tomatoes, sliced and interspersed with the bocconcini on a plate, sprinkled with some sea salt and freshly ground black pepper, then drizzled with the best EVOO you can get your hands on and finally some fresh basil scattered about. YES…this is the only way to properly enjoy the salad. Not in bloody December with those horrible out-of-season things. I am at a loss as to why in the world any self-respecting chef does not recognize that if they have this item on their menu, it should be there SEASONALLY! If it ain’t in season, it’s ain’t on the menu! You might be able to get away with roasting some hot-house tomatoes which will intensify their flavour and use those for your salad in off-season, but that’s about it. Of course, the fresh basil will not be as flavorful, but will be OK! Another thing…I have an Tuscan cookbook that suggests using tomatoes that are still a bit green near the stem for this salad. Hmmm, will have to give that a go next summer. It might just work, the tomato will have just enough acidity to offset the bland milkyness of the bocconcini. It feels really great to finally get if off my chest! This is my very first book review and I have a great reason for that! 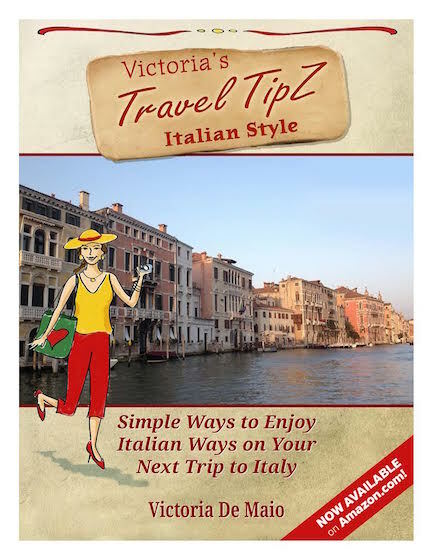 I have a high regard for Victoria De Maio’s travel knowledge and she has written her first book, “Victoria’s Travel TipZ Italian Style” which I am delighted to recommend to you. I wish Victoria had written her “how-to-do-Italy” in 2007 before our first trip to Italy! Although it’s written with a focus on American travellers, I think it would be welcome reading by pretty much anyone wishing to travel in Italy. Before we set foot on Italian soil we had read an awful lot of stories written by ex-pats who had given up the North American lifestyle for the “simpler” life of Italy…or so they thought! And we had read all sorts of stuff on-line as well, and of course devoured Frommer’s guide books like crazy, so we had a fairly good idea about a lot of things a traveler in Italy might encounter, but her “Travel TipZ” would have given us even more insight. P.S. : We have made four trips to Italy and are planning our fifth in the fall of 2015, so we can be included in the “well-hooked on Italy” group and “Travel TipZ” will be joining us on this trip! Victoria’s “Travel TipZ” is the perfect size to tuck away in your carry-on bag or to carry with you walking around. Buy the book…you won’t regret it…available through www.amazon.com/author/victoriademaio for downloading into Kindle or available as a hard copy. Making this bread is a tradition in our house & so is having some on Christmas morning, with coffee, sitting up in bed opening our Christmas stockings! It’s not hard to make and while things are rising, you can decorate your house! 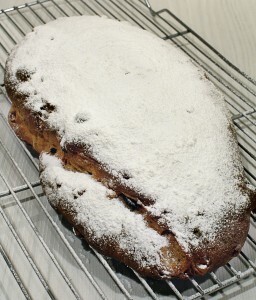 For years I have been making two stollen for the parents of a very good friend, all of whom were born in Germany. My friend’s father absolutely loved it because “It tastes exactly like the stollen I ate growing up in Germany! I think that is a great endorsement! Stir together 1 ½ tsp. lukewarm milk, 1 ½ tsp. lukewarm water & 1 ½ tsp. sugar in large bowl. Add the yeast & stir until smooth. Let stand until foamy, about 10 minutes. Add the flour & remaining 1 1/3 cups of lukewarm milk & mix well. (I heat the milk up just before I need it). The sponge will be very stiff. Cover & let sponge rise in a warm draft-free area until doubled in volume, about 1 hour & 15 minutes. About 15 minutes before the sponge is ready, using a stand-mixer or hand-held electric mixer, beat the unsalted butter & sugar in a large bowl until light & fluffy. Beat in the eggs, cardamom, vanilla & salt. Beat in the sponge when it’s ready, stir in the fruit & nuts & mix in enough remaining flour ½ cup at a time to form a slightly sticky dough. Turn dough onto a lightly floured surface & knead until smooth & elastic, about 10 minutes, adding more flour if very sticky. Toss the 3 Tbsp. flour with the raisins, slivered almonds & candied fruit in a medium bowl & quickly but thoroughly knead into the dough using a bench scraper to help fold the dough over the fruit & nut mixture. Lightly oil a very large bowl. Add the dough, turning to coat the entire surface with oil. Cover bowl with plastic wrap. Let rise in a warm draft-free area until doubled in volume, about 2 ½ hours. (I have made up a technique for this that works really well. (I set the bowl of dough over, not in, a pot of hot tap water). I have found by doing this my dough rises in2 ½ to 3 hours otherwise the dough is cold after the kneading & takes time to warm up & begin it’s rise taking a lot longer. Just make sure the water is hot tap water, not boiling water and you only need 3” or so of water so the bowl of dough is suspended over, not in, the water. Line two rimmed baking sheets with parchment paper folded to fit if necessary. Punch the dough down, divide in half; pat each half into a 10 x 6” oval. Roll the room temperature marzipan into a long rope approximately ¾ to 1” in diameter. Lay the marzipan, lengthwise down the middle of the ovals of dough, then 1 side of the dough over top of the other, enclosing the marzipan inside. Pat each oval gently to flatten slightly; place on the prepared baking sheets; cover with a large towel and allow to rise in a warm draft free area until almost double in volume, about 2 hours. Position the oven racks in the lower third of the oven (that’s if you can comfortably fit both baking sheets on one rack, otherwise place the racks far enough apart so that the stollen can rise without touching the oven racks & bake on two racks, which is what I always do, switching the pans from the top to the bottom so they bake evenly. Bake until the loaves are golden & sound hollow when tapped on the bottom, about 1 hour. In the meantime melt a few tablespoons of butter & keep warm. Transfer the baked stollen to a rack & cool slightly, brush with the melted butter, then using a sieve, sift the sugars over top in a heavy layer. Cool completely, then wrap in plastic wrap. Best served the next day or keeps very well in the fridge or you can freeze them too to get a head start on Christmas baking!